E: Hi Kristina! Thanks for doing this interview. I'll start off with my very first thought when I saw your book: Cyrano de Bergerac?? How did you decide on Cyrano in a middle school setting? And get it to work so well! K: Often times I’ll be reflecting on something that happened when I was the age of my characters and then spin it into a fun tale. When I was in 7th grade I took my own stab at middle school matchmaking. Back then, one of my close friends was majorly crushing on a boy from my brother’s soccer team. She said she really wanted to go on a date with him but was too shy to approach him herself. Well, we didn’t have cell phones or the Internet back then so there was no sending him a tweet or an e-mail. Instead we came up with a plan where I telephoned him, pretending to be her, and convinced him to meet me (really her) for a movie. Their date, unfortunately, was a disaster. But it gave me the idea to try updating the Cyrano tale with some fun twists and setting it in the 7th grade. Now that sounds like fun. So then I have to ask: did you ever see Roxanne with Steve Martin? Ha, how many people have asked you that since you wrote this book? Ha, I love that movie... Anyway, Twitter is a key element to the story, and I admit I stalked your profile (I also love The Gilmore Girls!). With such a plethora of social media options, any particular reason for choosing Twitter? I can’t wait for the Gilmore Girls revival!!! But that’s not what you asked. 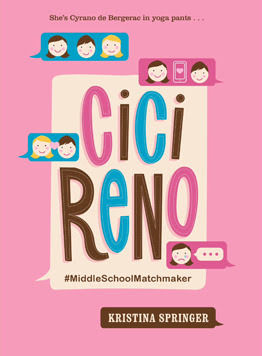 ☺ I do like being on all the different social media platforms but when it came to writing this book I wanted Cici to be able to easily hide who she was (and not need to have a ton of pictures on her account) and it seemed like Twitter was the perfect place to do it. If you could create a hashtag for yourself, what would it be? Well, it feels every hashtag on earth has already been created. ☺ But the one that most represents me and my daily life would be #authormom. I’m always carefully trying to balance the two passions in my life—writing books and taking care of my four kiddos! Yes, from your bio and other interviews, it's obvious that family is really important to you. How do your kids influence your writing? How do they feel about having an author for a mom? The influence me tons! I grill my thirteen-year-old son for details all of the time. And my eleven-year-old daughter fills me in on the school drama daily. I’m also a big sneak because I volunteer loads at their schools: working in the library, helping in the publishing center, and running the book fair. So I get to watch and eavesdrop a lot too. But I call it “research.” And my kids LOVE that mom is an author! They tell everyone at school. ☺ It’s funny because I’ve had books out since 2009 but this is the first book they’ve cared about. They were always too little for my other books whereas soon as a finished copy of this book arrived they asked me to read them a few chapters every night. Yes, you've published quite a few other novels! But your education is more on the teaching/technical writing side of things...how did you make the jump to middle-grade/YA fiction? How does that training affect your writing style? I didn’t think I could write fiction until I gave it a try when I was thirty! I had written all kinds of other things—software manuals, online help, magazine articles, parenting blogs, and loads of lesson plans and presentations. But I just got an idea for a YA book one day when two of my kids were babies. I was telling my husband about it and he said I should get out of the house in the evenings and go to a coffee shop and try to write it. And I really could use the break if nothing else. So I did it and wrote my first book. I got my first agent with that book but we ended up selling my second book for publication. As far as how my background affects my style I don’t think it affects my fictional voice in any book (since when I wrote technical documents I needed to always remove any voice from whatever the document was) but it helps me with grammar and sentence structure and I find I can easily outline my books. I tend to be able to quickly see where each point needs to hit and I write very plot-driven books. What's your favorite part about writing fiction? The first draft! Like I noted above I write plot-driven books so once I’m off and writing I can go beginning to end fairly easily. I then go back and carefully expand scenes that need more depth and work more on my characters. The second book in the Yoga Girls series. Oh goody, I'm looking forward to it! Okay, here's a fun one: what's your advice for aspiring writers in less than 140 characters? Read as much as you can in your genre & write, write, write! Just get words down on paper. You can always go back and revise later! And I like to wrap up with some lightening round questions: Favorite yoga position? Favorite drink from the coffee shop? Favorite way to spend your spare time? Batman or superman? Savasana (aka, corpse pose). Iced Mocha. Swimming. Superman. Awesome, thanks for your time, Kristina! Kristina Springer is the bestselling middle grade and young adult author of The Espressologist, My Fake Boyfriend is Better Than Yours, the Just Your Average line of books (Just Your Average Princess, Just Your Average Geek, and Just Your Average Celebrity), and the forthcoming Cici Reno #MiddleSchoolMatchmaker (Sterling Children's/April 2016). She has a Masters in Writing from DePaul University and resides in a suburb of Chicago with her husband and children. 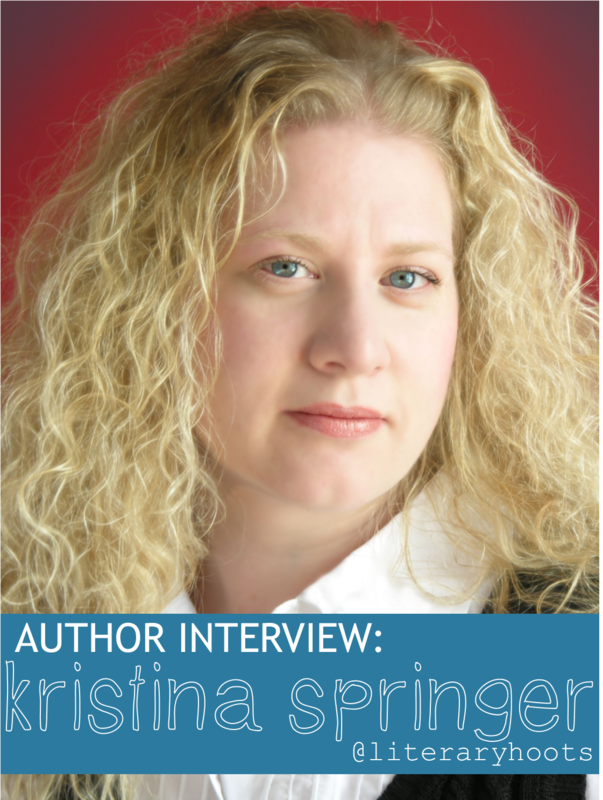 Learn more about Kristina on her website, and be sure to follow her on Twitter.